FOR THOSE with the good fortune to be both American and Jewish, not one but two holidays are at hand. As the grace of Thanksgiving fills the land, Chanukah waits in the wings. The menorah's first flame, ushering in the eight-day festival, will be lit one week from tonight. The tyrant Antiochus IV sought to impose his Hellenistic ideology throughout the Seleucid empire. But in Judea, religious Jews balked and launched a revolt. It's too bad Chanukah and Thanksgiving aren't this close every year. Though they commemorate events nearly 1,800 years apart, the two holidays resonate deeply. It is worth reflecting for a moment on just how much they have in common. Chanukah celebrates the Jewish victory over the Syrian-Greek tyrant Antiochus IV, who sought to impose his Hellenistic ideology throughout the Seleucid empire. He succeeded nearly everywhere. But in Judea, religious Jews balked. Faithful to their Torah and their one God, they rejected Hellenism, with its network of pagan gods, its cult of the body, and its obsession with public games. In 167 BCE, the Jewish revolt began. The aged priest Mattathias and his five sons, led by Judah Maccabee, launched a guerrilla war against the vastly more powerful Syrian-Greeks. Though impossibly outnumbered, they won miraculous victories. 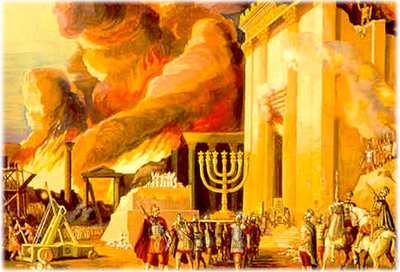 In 164 BCE, the Maccabees recaptured the desecrated Temple, which they cleansed and purified and rededicated to God. The menorah -- the candelabrum symbolizing the divine presence -- was rekindled. And so the little band of believers took a step fraught with risk: They sailed to America. It was a nearly suicidal endeavor. Published guides of the time advised voyagers to the New World: "First, make thy will." On November 21, 1620, after a fearful crossing, the Mayflower anchored off Cape Cod. Five weeks later, finding no better landing place, the Pilgrims waded ashore at Plymouth. To be with their God, to worship in peace, these people had uprooted their lives and forsaken everything they had known. Now they would see half their number -- husbands, wives, children -- die of sickness and starvation. The Pilgrims suffered every loss imaginable -- except the loss of faith. Plymouth was not the first settlement in the New World. Jamestown, in Virginia, preceded it by 13 years; the Spanish had been in Mexico for a century. But the Pilgrims built the first colony founded on a principle: the right to worship as conscience dictated. In time, Plymouth slipped into theocracy. 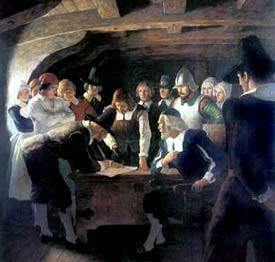 But the Pilgrims' idealism and fortitude inspired others: American democracy first stirred at Plymouth. We may have secularized them and materialized them, but under the tinsel and the gift-wrapping, these holidays are about religion. Each is rooted in the triumph of belief over persecution. Each draws its power from the courage of men and women who endured terrible suffering for their devotion to God. And each is a reminder, as we head into the blackest nights of winter, that nothing can overcome the darkness like the light of faith. (Jeff Jacoby is a columnist for The Boston Globe. A version of this column appeared in 1994).